Here's part 2 of some change we've made in our dining room. We're really watching our budget these days and I was looking for a way to get new dining room chairs for cheap. I found these chairs at Goodwill and made them our kitchen chairs. So then I gave our old kitchen chairs a makeover and they become our new dining chairs. All in all, I spent about $100 on the chairs and fabric and now have 4 *new* chairs for the kitchen AND dining room. Simple IKEA dining chairs that we've had for almost 10 years. Not sure of the name, they don't seem to carry these anymore. This is how I always start painting my chairs. Prime first. As you can see, I did a shortcut. I knew I'd be slipcovering the top, so I didn't bother painting the back. If I wanted to be real thorough, I probably could've and that would've given me the option of taking the slipcover off. Here they are, 1/2 way done. I just used left over gray paint from the dining room. Worked perfect. I slipped a pillowcase over the chair just to get a feel for the finished product. This was my inspiration for the slipcover. I don't really sew, so this is about as much as I can handle. Ta Da! I like the contrasting fabric of the seat cushion and back. It's one of those things that is a bit off, but I think it gives it some interest. The fabric was Waverly Bedazzle Silver Lining. Found it Joann's for 50% off, $24.99/yd. 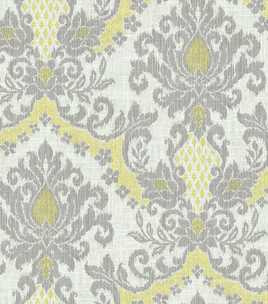 Love the slight ikat pattern and the yellow/gray was just right for the room. Sorry, couldn't find the name of the seat fabric. It was in the same section, all coordinating fabric with the Bedazzle. Lastly... a quick painting tip. It was SUPER easy to paint my IKEA laminate chairs. The primer went on smooth and so did the paint. If you've considered painting your IKEA laminate furniture... do it, it's so easy!